With Spring and Easter just around the corner (the 1st day of Spring in March 20!!) we wanted to share some fun and easy treat ideas that you can make with the whole family. The Easter Egg Cupcakes featured above are a snap with a few items and will look great on your Easter table. We used a set of Hoppy Times Cupcake Wrappers to dress up ordinary cupcakes. 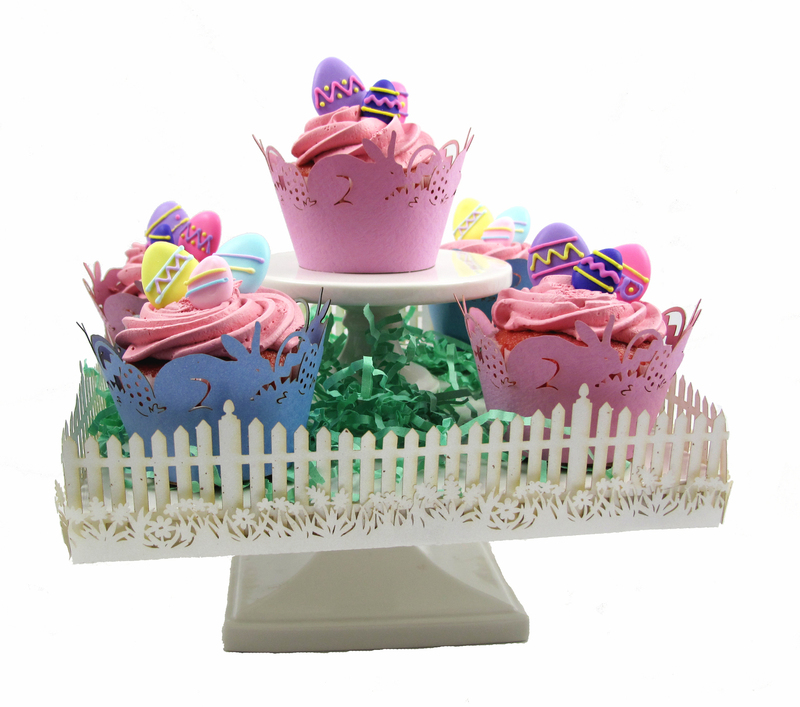 We placed Bright Icing Easter Egg Decorations in the frosting and arranged the cakes on a white cake stand, decorated with the our Picket Fence Cake Stand Wrapper. After adding a bit of green crinkly paper for grass this dessert tray doubles as a colorful centerpiece. Next we have adorable little bunny treats that easily made with chocolate covered Oreo’s, graham crackers or any other chocolate covered treat. Simply affix Sugar Sweet Bunny decorations to each cookie using a dab of royal icing. Create the feet and tails by piping icing ovals (for the feet) and circles (for the tail) onto a sheet of wax or parchment paper. Let completely set before affixing to the cookie with an additional dab of icing. We placed our cookies on mini doilies to complete the presentation. 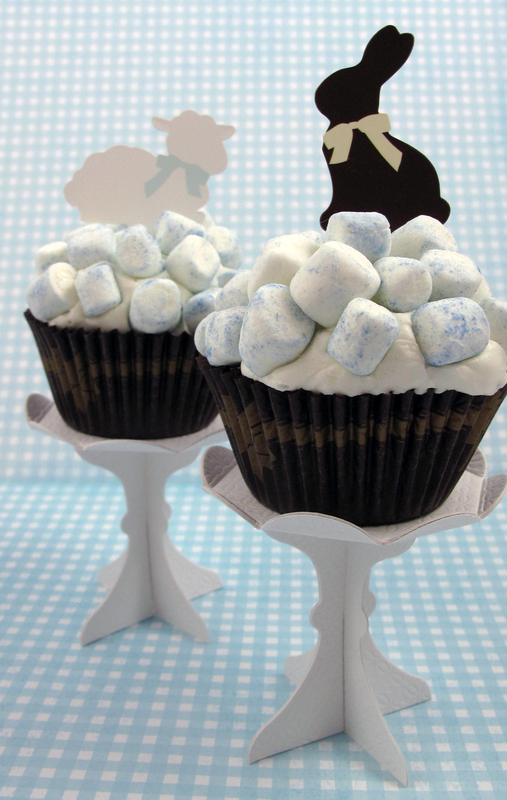 Lastly, these marshmallow cupcakes are too cute and simple to not try on your own! We used Ribbons and Bows Cupcake Liners, but any colorful cupcake liner would work well too. Next you’ll need to decide what color you want your mini marshmallows to be tinted. We used Sapphire Blue Luster Dust to tint our marshmallows…check out are huge collection of luster and sparkle dusts HERE. Sprinkle luster dust onto a piece of parchment paper and lightly roll each marshmallow through dust. Affix marshmallows to cupcake by gently pushing into the frosting to secure. Place a Rabbit and Lamb Pick into each cupcake to complete. Give your lovely treats a little extra height by setting each onto one of our new cupcake stands. These adorable stands are made from recycled paper and can be decorated as you wish to fit with different themes and holidays. Happy Spring baking! Join in on the Halloween Cupcake CRAZE! Try some of our easy cupcake ideas for your Halloween treats. Our selection of cupcake wrappers and picks for Halloween is sure to inspire! Ghost Cupcakes: Use a Peep instead of the Barley Candy for a fun twist (see photo above). To achieve the brightly colored hues of frosting we recommend using the gel food colors – to get a rich black color you may need to use as much as half of the bottle of color – but boy is it worth it! Don’t forget to browse our selection of sprinkles, sugars and quins to add an extra splash of color and sparkle to your baked goodies.